One of the more intriguing true life crime dramas in recent years comes screaming back to life on the big screen in True Story. 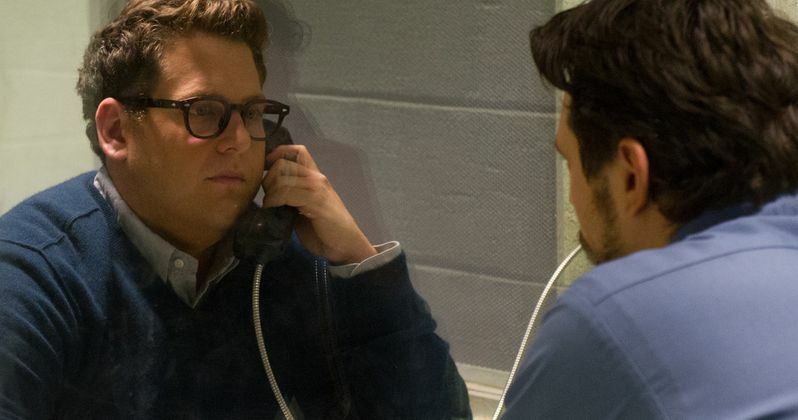 Fox Searchlight Pictures and Regency Enterprises have released the first images, which feature This Is the End co-stars James Franco and Jonah Hill reuniting for a much more serious topic. Directed by Rupert Goold (Macbeth), the film is based on the book by Michael Finkel. When disgraced New York Times reporter Michael Finkel (Jonah Hill) meets accused killer Christian Longo (James Franco), who has taken on Finkel's identity, his investigation morphs into an unforgettable game of cat-and-mouse. Based on actual events, Finkel's relentless pursuit of Longo's true story encompasses murder, love, deceit and redemption. True Story will be in theaters this spring. Felicity Jones co-stars in the film, produced by Dede Gardner, Jeremy Kleiner and Anthony Katagas, and executive produced by Brad Pitt and Arnon Milchan. Check out the images below. Then stay tuned for the trailer debuting this Thursday!